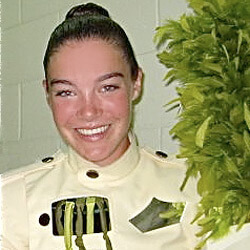 Katie Rozacky, 18 University of North Texas Carolina Crown Mellophone, 2008-2009 How did you choose your corps? I chose Carolina Crown based on what I had heard about the brass program and because of my band director, a then former (and now current) brass staff member. I honestly didn't know that much about any organization when I first auditioned and had to go off of what I was told by others and my own experiences. In your experience, what's the best way to prepare for an audition? The only way to prepare yourself for an audition is to practice. Practice the music you plan to play at the audition and condition your body for the physical portion of the audition. You should also do both together, playing and marching at the same time, because ultimately you will be auditioned on that skill too. What can a prospective corps member expect when he/she shows up for an audition weekend? You'll more than likely see a lot of people at the audition. As long as you came prepared though, you have nothing to worry about. Besides the musical portion of the audition, you'll also be expected to do some physical activity. No matter what, never give up. Keep running and doing pushups, because however slow or tired you get, if you show that you won't give up it'll put you ahead of all those who did. The first time you auditioned, was the process different from what you expected it to be? Yes and no. I expected to be nervous, and I was, but I didn't expect the process to last so long. The audition process wasn't just one camp long, for some people it lasted for three camps. Those who returned filled available spots while others decided to take themselves out of the running between the camps. Were you nervous at your audition? I was very nervous. The only way I got past it was to realize that I had prepared the best I could. When I get nervous, I remind myself that I enjoy playing my instrument. If I keep that in mind and don't worry about what the judges think, it makes it easier to play like I've practiced. Relax playing the piece you've chosen to prepare, and be sure to entertain! What do you think is most important for someone to take away from the audition experience? Take away the experience of preparing for the audition process (whether you prepared enough or not enough). The more auditions you go through, the easier they become. Next time don't be so nervous. Take away the things you will learn about brass playing or whatever section you are auditioning for. Throughout the weekend you will more than likely be 'enlightened' to new ideas or concepts that can be applied to your concert playing. Any other advice? Bottom line, it's just marching band. Try not to get too nervous and just have fun when it comes to showing off the skills you have! Learn more about corps audition dates, locations and additional info.